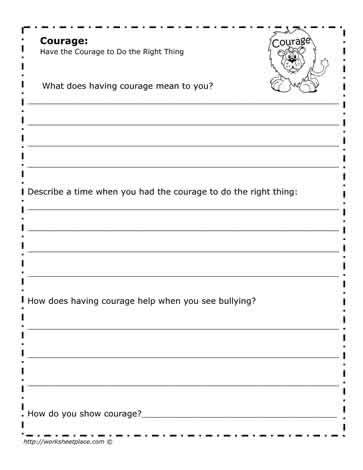 This worksheets helps students think about what courage is. Students look to themselves to determine what they have done that could be considered using courage. Courage doesn't necessarily mean being brave, courage links to doing the right thing even when it's hard. Sometimes it takes a little courage to let the teacher know you didn't do your homework because you forgot, or didn't feel like it. Sometimes it takes courage to stand up for a friend who is being bullied, even though you might be afraid to do so, it is important. Schools are great places to have students focus on the character trait of courage.